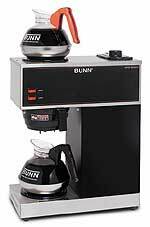 the Bunn VPR coffee brewer is a 12 cup pourover brewer brews 3.9 gallons of perfect coffee per hour. 2 burners. Internal components are constructed of stainless steel. Pourover brewer requires no plumbing - completely portable. Just pour cold water in top and coffee brews immediately. Two separately controlled warmers. Integral part of any office coffee service program. SplashGuard funnel deflects hot liquids away from the hand. UL listed, NSF approved. Decanters not included. 20.7"H x 15.9"W x 8"D. 120V 13.1 amps.